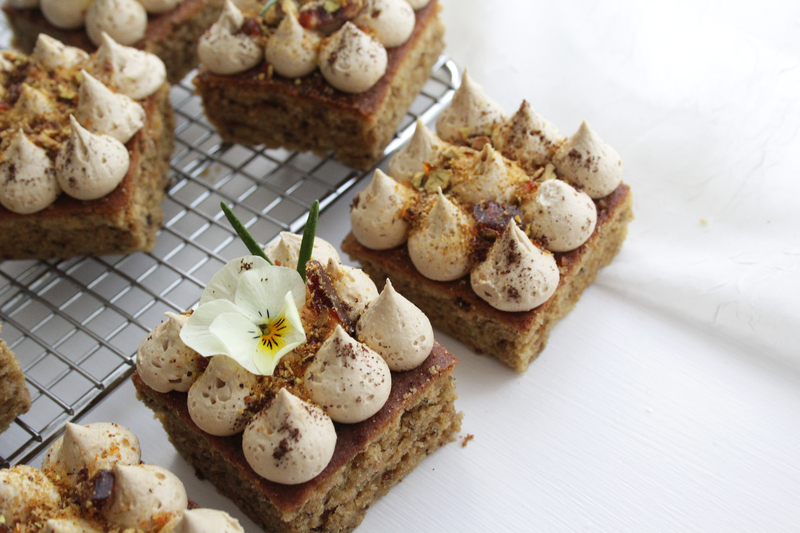 Coffee cake is one of my all time favourites, but this spin on a classic is perhaps even better (I know, big claim). 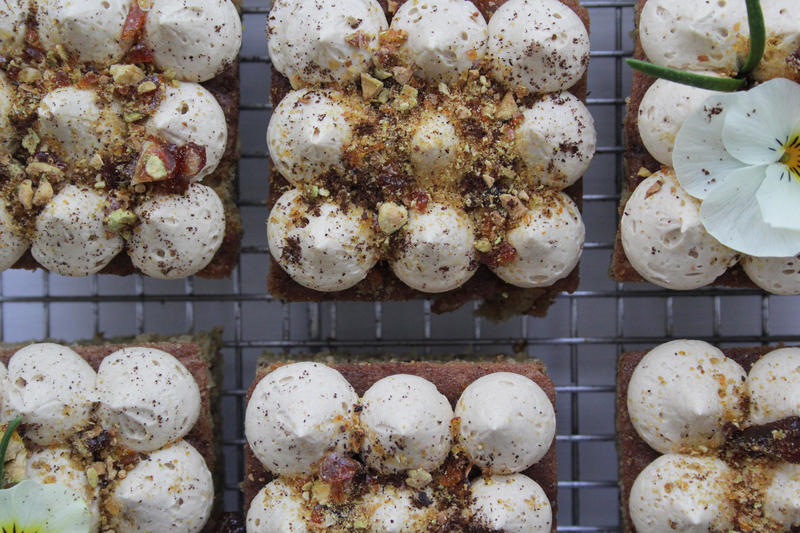 The cardamom hum in the sponge goes really well with the simple coffee buttercream, and the crunch of earthy pistachio praline rounds off the overall flavour and prevents it from being overly sweet. 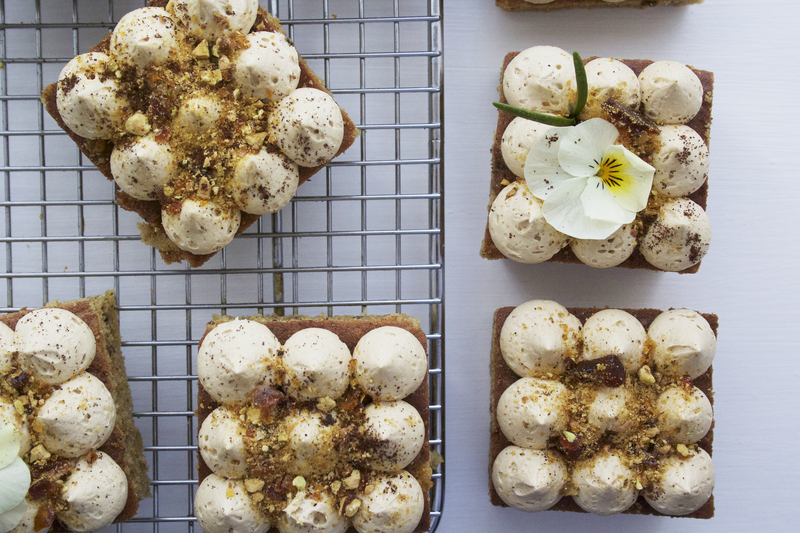 Make these for any occasion (you can fool people into thinking they’re fancy with the help of a piping bag and edible flowers) and they are sure to go down a storm. Preheat the oven to 170c. Grease and line a brownie tin (around 20x20cm). Cream together the butter and sugar until light and fluffy then add in the eggs one at a time, mixing well between each addition. Add the flour, salt and ground cardamom and fold in until well combined. Do the same with the coffee and milk. Once your straightforward batter is ready, spoon into the tin and level off. Bake for 30-35 minutes until well risen and a skewer comes out clean when inserted. Cool in the tin. While the cake is cooling, make the praline. Place the sugar and pistachios in a heavy bottom pan and allow the sugar to melt (don’t stir, just tip the pan to move the sugar around). Once it’s melted and golden, swirl the pan to coat the nuts in the caramel then tip onto some greaseproof paper and leave to set hard. Now make your buttercream. Beat the butter until light then gradually add the icing sugar, whisking until very light. Add in the coffee and whisk again to combine. Once it’s streak free and smooth, pile into a piping bag ready to decorate. 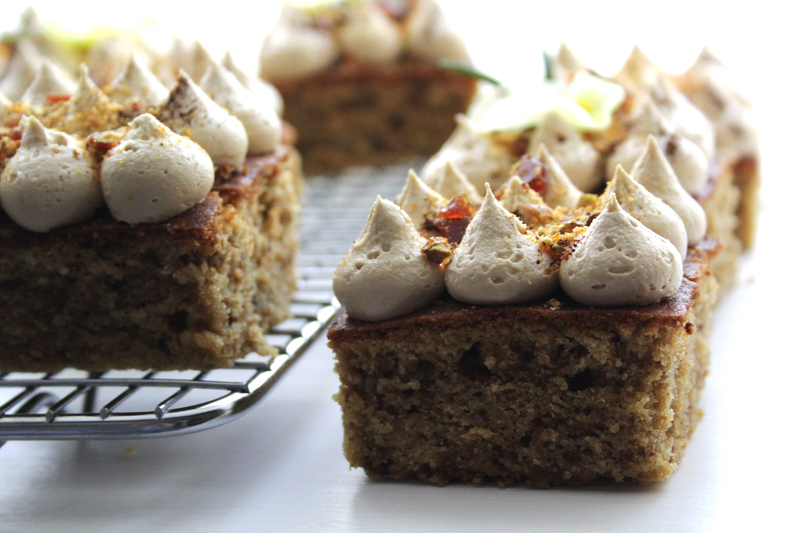 Slice the cooled cake into nine squares (or larger/smaller pieces depending on your appetite!). Pipe the coffee buttercream on top in little kisses (or freestyle with rosettes/patterns using different nozzles). Break up the praline and roughly crush then sprinkle a generous helping on top of the buttercream.